It’s easy to forget things when cleaning. Sometimes we forget because we don’t see them, like the top of the refrigerator. Some things we forget because we don’t touch them on a daily basis, like wall hangings. Even as a person who likes to clean, I’m guilty of missing many of these items! It’s like out of sight, out of mind. Eek! Here are 25 things you may have missed while cleaning. 1. Indoor garbage cans. A solution of a half cup of bleach and a gallon of water will kill the bacteria. 2. The washing machine and dryer. The washing machine seals get moldy and need to be cleaned, and the dryer lint catcher needs to be vacuumed out on a regular basis to prevent fires. 3. Telephone receivers. If you still have a landline, make sure to clean your receivers. Every time you talk on the phone, germs come out of your mouth and land on it. So if you have the flu, you’re inadvertently transferring it to the next person who uses the phone while you’re calling the doctor. 4. The back sides of your faucets. Mold and bacteria love to collect there. 5. Utensil drawers. Vacuum and wipe these out every couple of months and grease the tracks with a bar of soap so they move smoother. 6. Knife Block. These collect dust on the back and sides, and because they’re often a light wood colour, you don’t see it. 7. Anything hanging on the wall. Artwork and picture frames collect often unnoticed dust, especially on the tops. Be sure to include them with your weekly dusting routine. The same goes for the tops of door frames. Since you don’t see them, you forget about the dust that hides up there. 8. Porch lights. Usually you’re not outside cleaning at night when the light is on to notice the dirt and dead bugs building up, so this is an easily forgotten item. 9. Exercise Equipment. Because sweat is a bodily fluid, your exercise equipment gets pretty nasty and germy every time you use it. If you’re a daily user, clean it at least once a week. If you primarily use your treadmill for hanging clothes, it can be cleaned about once a month. 10. Ceilings. Twice a year is fine, as long as it gets done. 11. Inside corners of closets. We often clean out our closets, but don’t really clean our closets. Make sure you vacuum the dark corners where the spiders like to hide. You don’t want to find them in your pants after you put them on. 12. Box Spring. It’s not easy to get to, but box springs need to be vacuumed when you flip your mattresses. 13. Plants. We don’t always think about cleaning indoor plants, but dust loves to collect on them. Spray them with water and wipe them off. Also check for any insects and dispose of them. 14. Blinds. Depending on the material they’re made from, you’ll need to either vacuum, wash, or dust them at the very least with the change in seasons. 15. Toothbrush Holder. The toothbrush holder and soap trays in the bathroom collect hard water deposits, and even worse, overspray from the toilet when it’s flushed. As a matter of fact, you shouldn’t even keep a toothbrush holder on your bathroom sink, but in your medicine cabinet to help keep the germs from reaching it. 16. Flush handle on the toilet. Everyone touches it after using the bathroom and before washing their hands. This should probably be cleaned on a daily basis. 17. Shower curtains. Most are machine washable, but the vinyl ones should just be replaced every few months. 18. The kitchen cutting board. Check with your manufacturer on this one. Plastic cutting boards can be cleaned with a solution of bleach and water, but wooden cutting boards need special care. 19. Walls. Washing walls a couple of times a year will keep them looking great. 20. Automatic dishwashers. The insides are usually clean, but the rubber seals around the door tend to get moldy after a while. Clean them and then run an empty cycle with bleach through every now and then to kill germs inside. 21. Space underneath appliances. No one wants to move the refrigerator and stove, but it needs to be done. All sorts of dust and grime collects under there, and unless you pull it out, it goes unnoticed for the most part. 22. The kitchen sponge. Kitchen sponges are one of the biggest germ catchers in your home. They can be easily disinfected by heating them in the microwave for a minute or running them through a cycle in the dishwasher. 23. Top of the Refrigerator. Most of us are too short to see the top of the refrigerator, but it collects grease, dust, and grime and should be cleaned often. 24. Vacuum Cleaner, including Brushes & Attachments. Cleaning your cleaner seems silly, but your vacuum picks up hair and dust and dirt and all of that needs to be cleaned out of the brushes and attachments in order to keep them working properly. 25. Ceiling fan blades. Every time you turn it on, the dust on them flies around the room, so the cleaner they are, the better off you’ll be. If you go through this list and take care of these things often, you’ll have a much cleaner home. 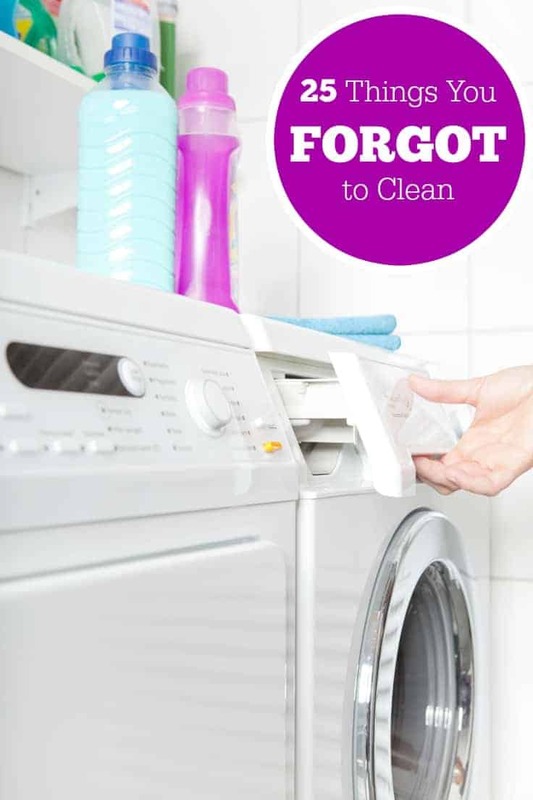 Do you forget to clean any of these items? I have to say that this is so true. I always forget to clean so many of these items. I need to get the inside garbage cans cleaned, but I did clean all the ceiling fans. And I wondered why the vacuum did not pick up anything last night and it was because the brush roller was clogged with hair! I love this list! And, yes, I always forget to clean the KNIFE BLOCK! There are so many areas that we don’t always remember to clean. One day I was unpleasantly surprised to see that the rubber around my fridge door (across the top) was filled with crumbs. Now I wipe it out when I clean my fridge. I use to practice all this but now I hire someone and forget about those things getting done, you have to hire someone else and at $30 per hr gets expensive..sigh for that money at 6 hrs shouldn’t have to worry but what can you do. The back sides of the faucets always disgusts me! Yuck! And my landline phone seems to collect make-up & dirt all jammed around the buttons where it rests against my face. Thanks for reminding us to clean all these germ-filled places! Looks like I’ve got some cleaning ahead of me! Excellent tips, I printed out this list, thanks! Excellent tips, I printed out this list, MAHALO!